The replacement neck arrived today, and the neck was prepared for installation on Coop's rascal. Camera ran out of memory before pictures of the neck oiling / polishing could be taken. Additional pictures and informational text will be added as work proceeds when I wake back up 12-6-08. Email will be sent regarding optional parts as said on page 15; (hopefully today as planned). As soon as the replacement parts guitar arrived I unpacked it and got to work on things. 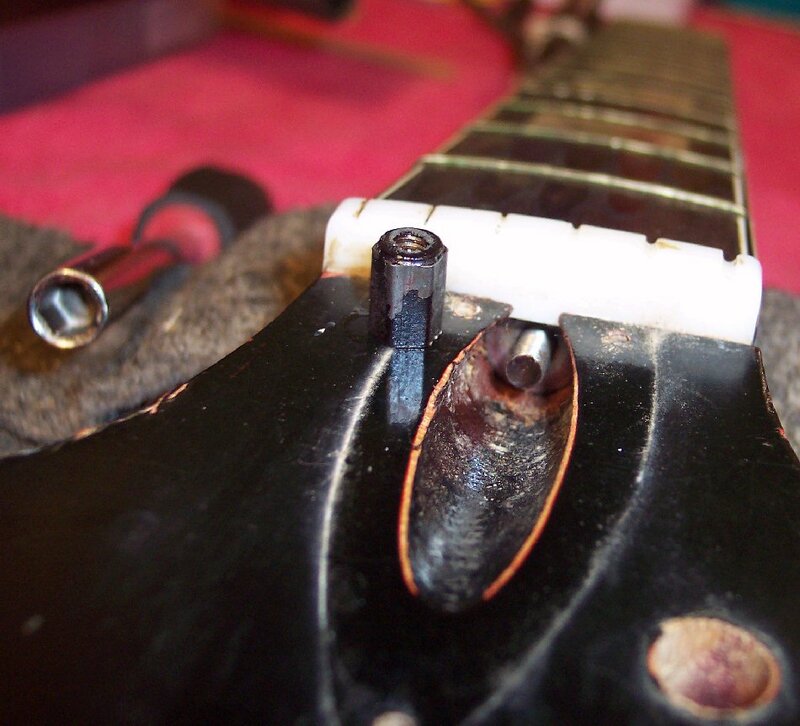 First order of business was to remove parts from the neck, and then loosen the trussrod nut, ensure it's viability, and treat it (oil) for reinstalling and tightening during reassembly and again after restringing. After the trussord viability was known, then cleaning the neck and fretboard and treating it them with replenishing oils was done. The trussrod nut was untouched by a wrench; Super clean, no wrench distortions. Good sign. Here we see the trussrod nut removed after a short soak in drops of innocuous light penetrating oil on it's tip and rear race / bearing. Perfect; Came right off with no abnormal resistance at all. The fuzzy white outline around the trussrod access cover placement, is a long history of polish wax and free-air dust accumulated there. But the accumulation of polish, wax and dust grime is good; The owner(s) played almost entirely open chords and thus likely to have made some meaningful boo-boos if they tried to "scrub" the guitar off. ~~~~~~~ And it did indeed take quite some careful scrubbing to remove all the polish wax and grime from this neck; Pictures of same provided on following pages. Nice and clean. Only original overspray, factory sawdust and black paint chips from removing the nut ....inside the access cavity. Notice the red overspray on the washer bearing; That tid-bit of info will support the info about finish bleaching explained later herein. Most modern tool sets, ....even cheap ones from China, .....have this very handy bit driver that just happens to be a 1/4" wrench size, ....the size of most truss rod nuts, and it will fit perfectly for reaching into trussrod nut cavities. Otherwise only a trussrod wrench or deep thin-walled 1/4" socket wrench will. 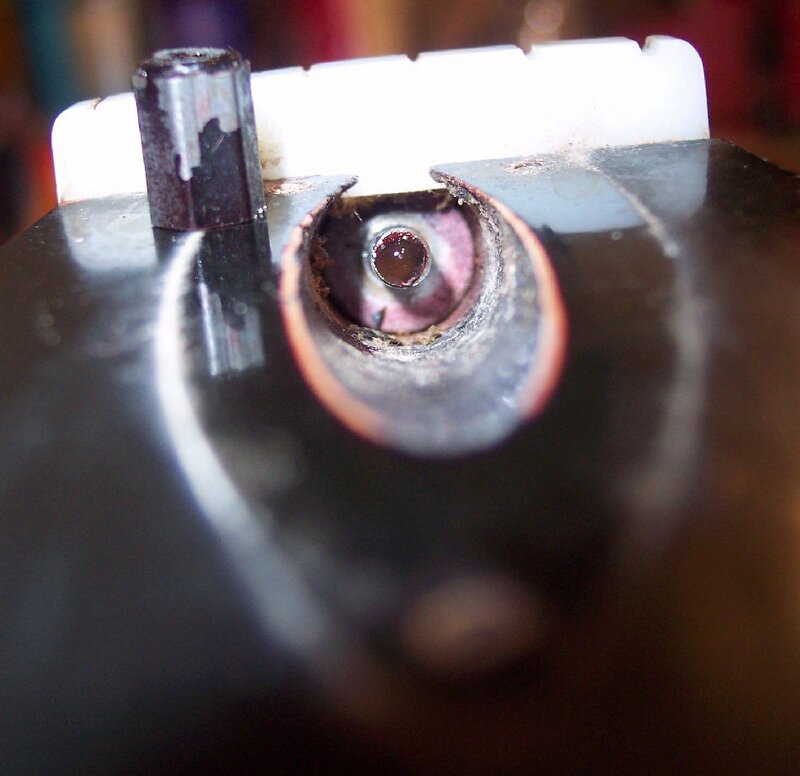 The trussrod nut is snugged back up with light oil on it's threads and rear washer bearing race. 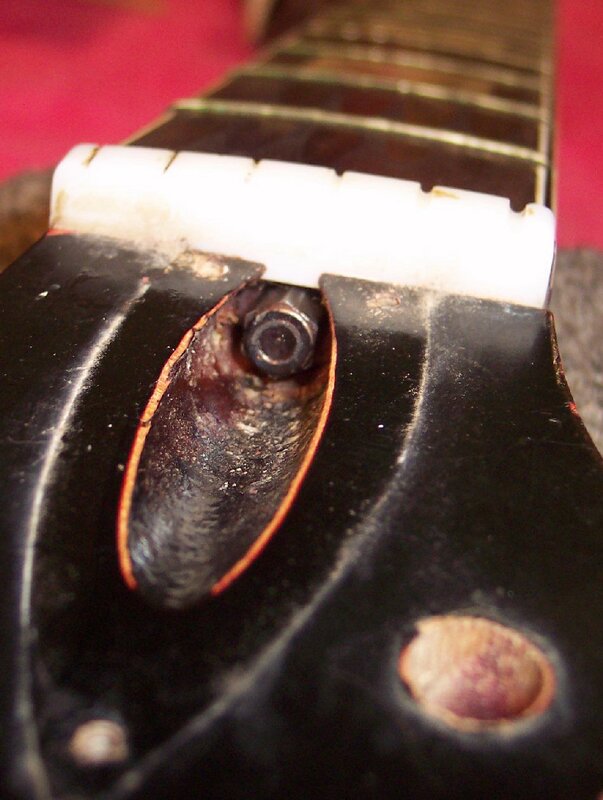 Less than award-winning automotive paint jobs on old guitars, did not stick to squared edges very well, and the reason that most old headstock and sharp edges have much of their old dried paint chipped off even from simply strings vibration; Seen here around the sharp upper edge of the trussrod access cavity.